Episode 62 - Summer Martin Dan Sterenchuk and Tommy Estlund are honored to have as our guest, Summer Martin. Summer considers herself a risk taker, dream chaser and rule breaker. She’s on a mission to live her best life while encouraging others to do the same. When she’s not selling software during the day, she’s behind the mic recording her podcast at night.Summer lives in Dallas, TX with her husband Todd and new puppy Charlie. 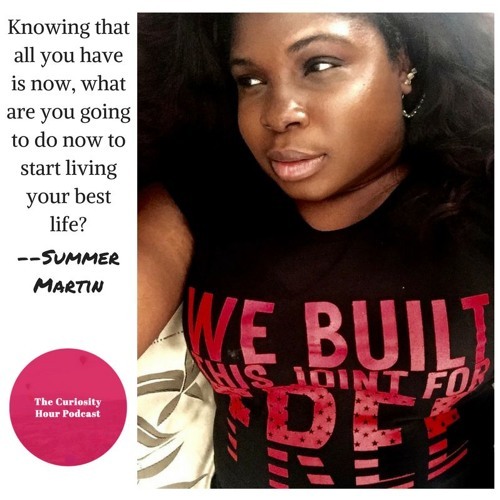 Summer’s podcast is The Unconventional Woman: https://www.tuwpodcast.com Note: guests create their own bio description for each episode. The Curiosity Hour Podcast is hosted and produced by Dan Sterenchuk and Tommy Estlund. Please visit our website for more information: thecuriosityhourpodcast.com Please visit this page for information where you can listen to our podcast: thecuriosityhourpodcast.com/listen/ If you would like to share your story or have a suggested guest, please complete the "Contact us" form: thecuriosityhourpodcast.com/contact-us/ Disclaimers: The Curiosity Hour Podcast may contain content not suitable for all audiences. Listener discretion advised. The views and opinions expressed by the guests on this podcast are solely those of the guest(s). These views and opinions do not necessarily represent those of The Curiosity Hour Podcast. This podcast may contain explicit language.